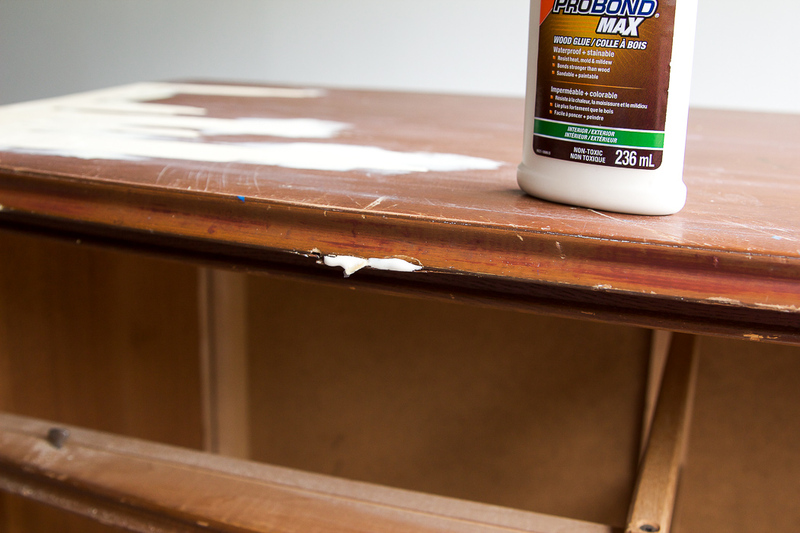 These 8 steps will show you how to fix badly damaged furniture. 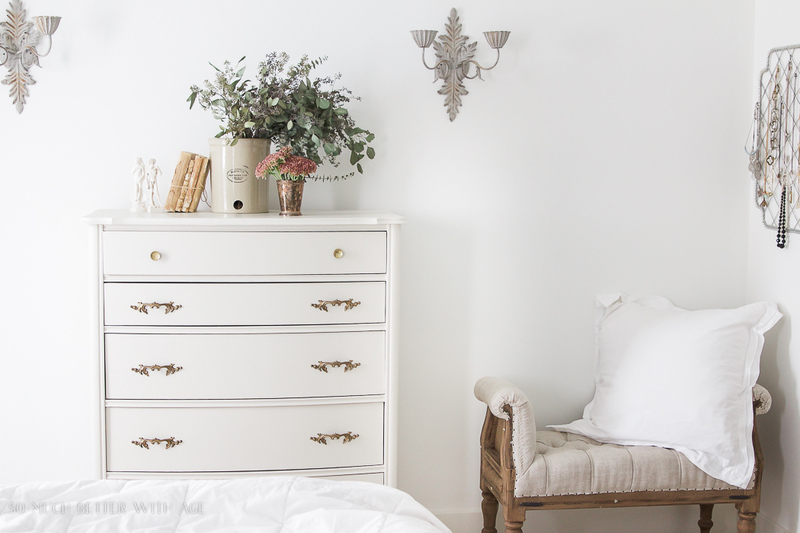 When I renovated this house I knew I wanted to have some painted dressers in the bedroom. 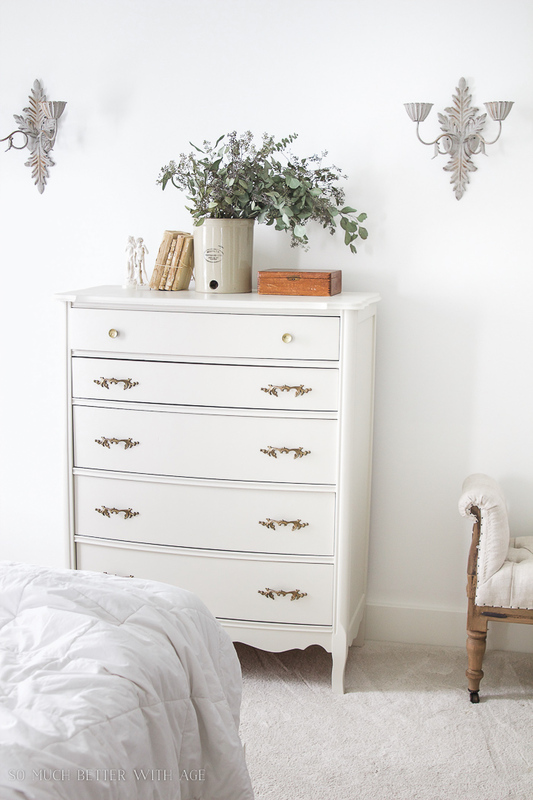 Dressers are always best if you can find them second-hand, hand-me-downs or free on the side of the road. Why? 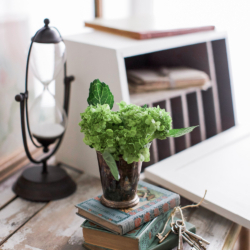 Because they are usually solid wood and it’s very rare to find solid wood dressers anymore. 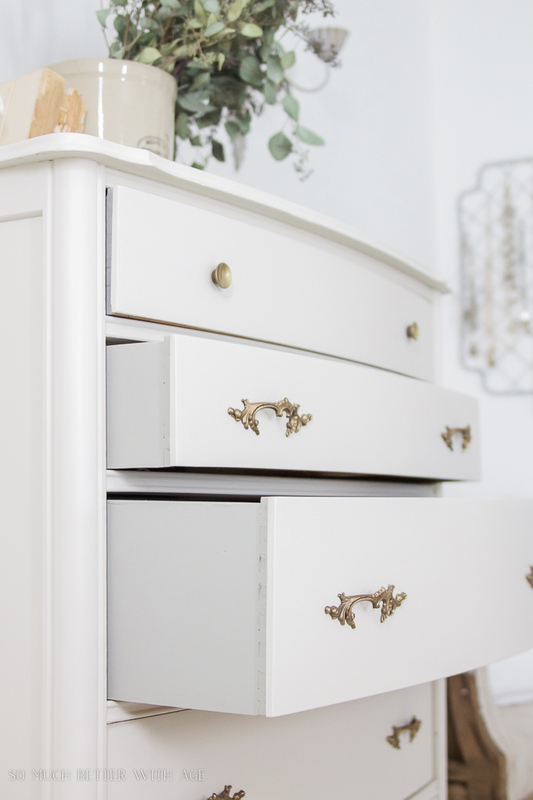 Most new dressers, even expensive ones, usually have some form of MDF or veneer parts to it, usually the backs or drawers. 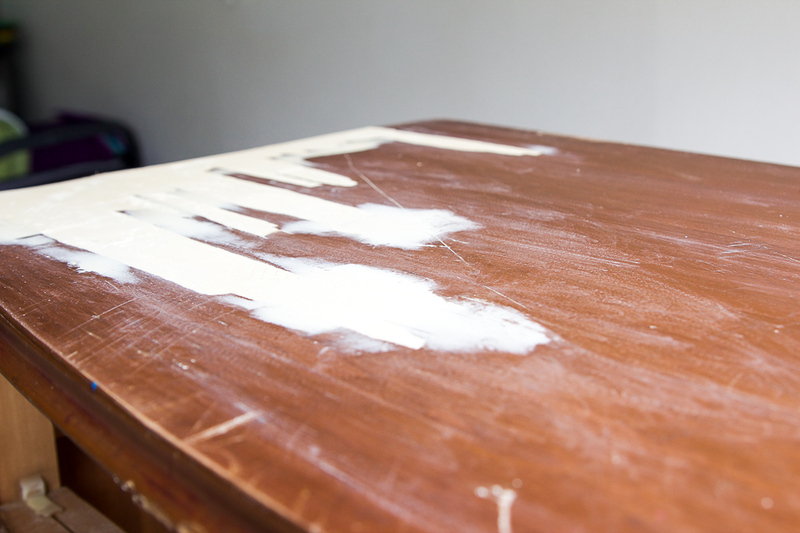 Every time I finish a dresser, there’s always something new to fix on it that I haven’t done on the last dresser. I’ve learned a ton along the way through trial and error and I’m sharing those tips with you today. 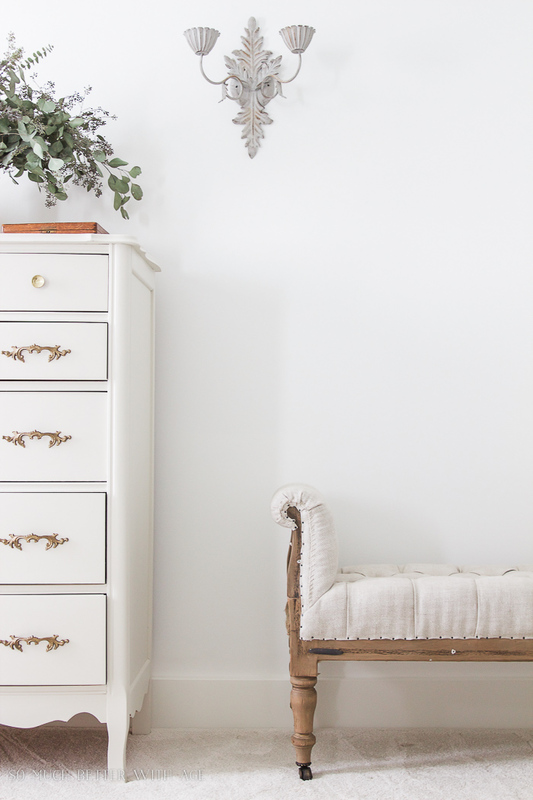 So you can have a stunning piece of furniture in your house for almost nothing but time and sweat and maybe a few tears. 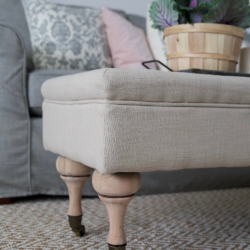 Okay, it really isn’t that bad, but if you are willing to be patient with a piece of furniture, it can be done. 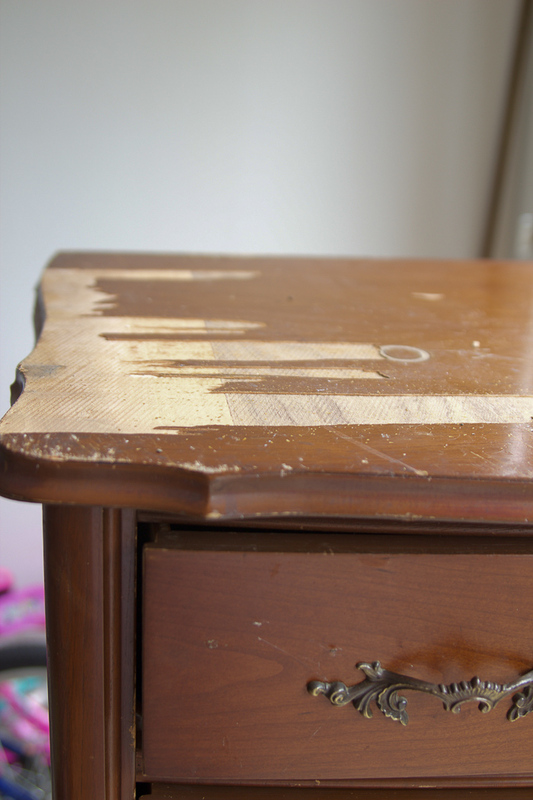 Here are 8 steps on how to fix badly damaged furniture. 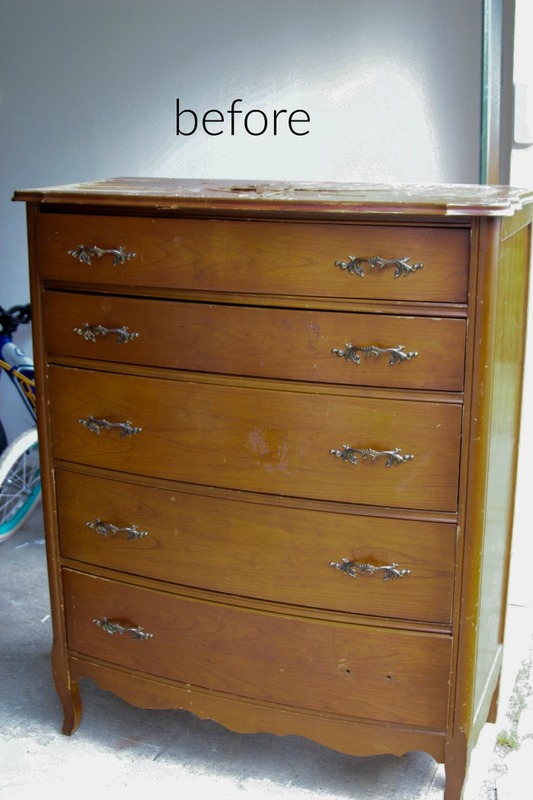 Here is my $20 dresser. I think that price is even a little much considering the condition it was in but it went to a good-cause-thrift-store so I didn’t mind so much. It really was in bad condition but I have seen worse (wait until you get to the bottom of my post!). 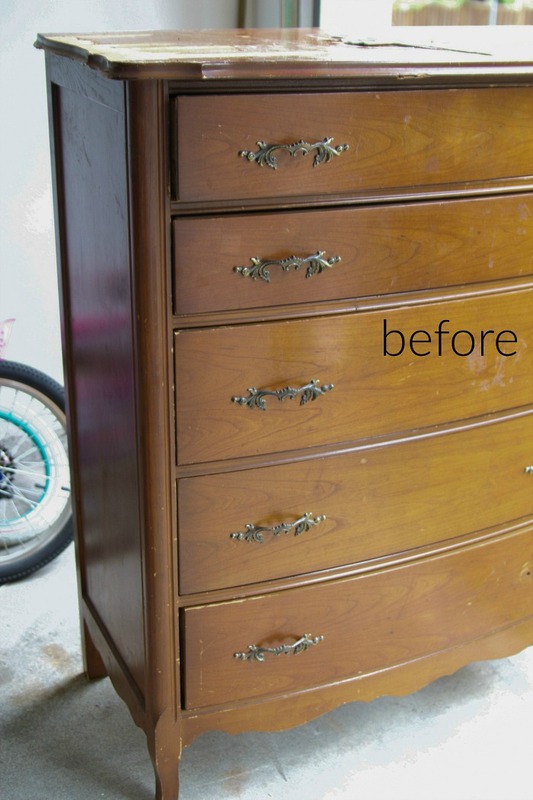 This dresser didn’t look like this when I bought it. There was some small flaking on the one side and when I touched it, it easily lifted off. So instead of puttying it down, I just lifted off all the loose bits. Now what? You putty like mad. 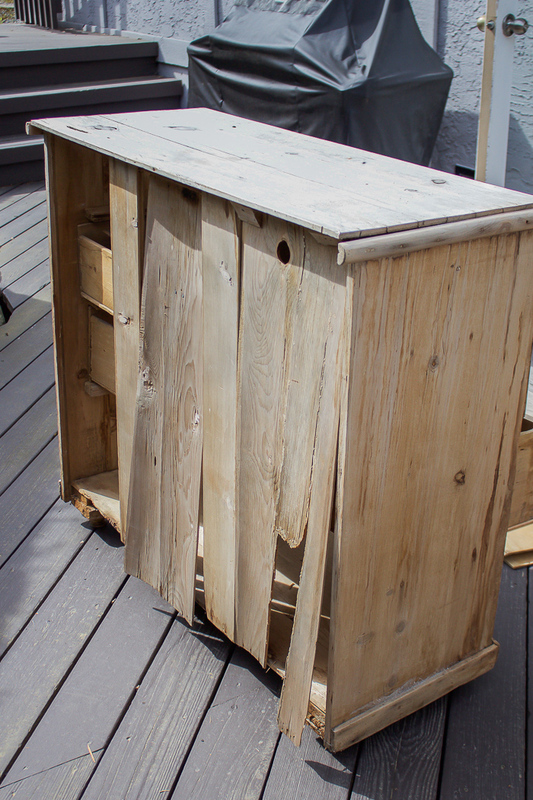 Buy yourself a few tubs of wood putty and give yourself a couple of days. 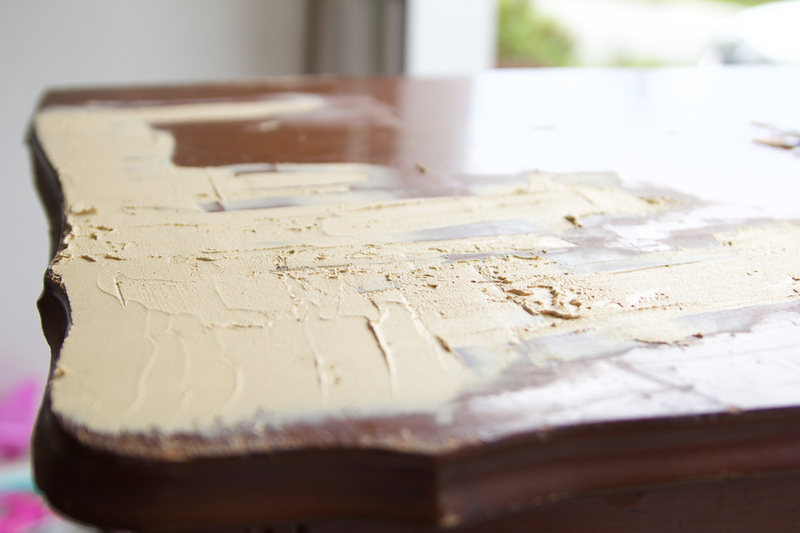 Apply the mud with a putty knife, let it dry and sand it (I used a hand sander for this job). 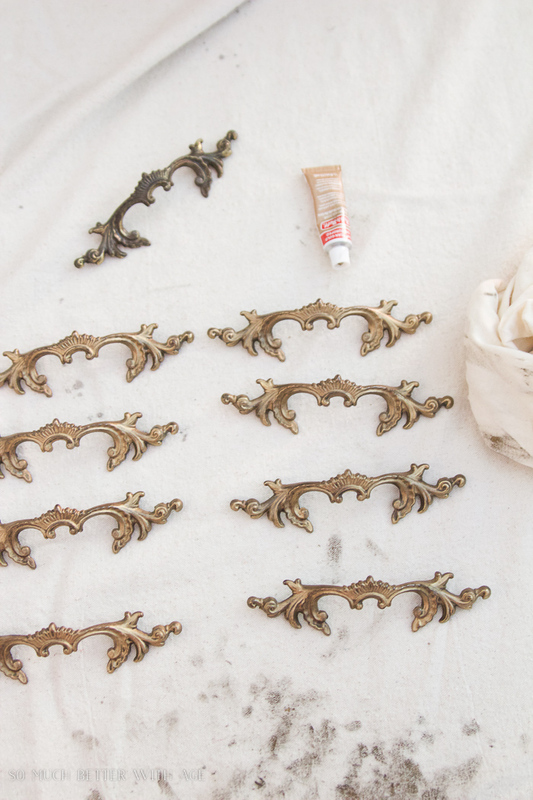 You’ll repeat this process over and over until you achieve a nice smooth finish. This is just what I’ve figured out on my own. I’m sure there is a more professional way to finish this top but I wasn’t looking to refinish it as I knew I wanted to paint it. 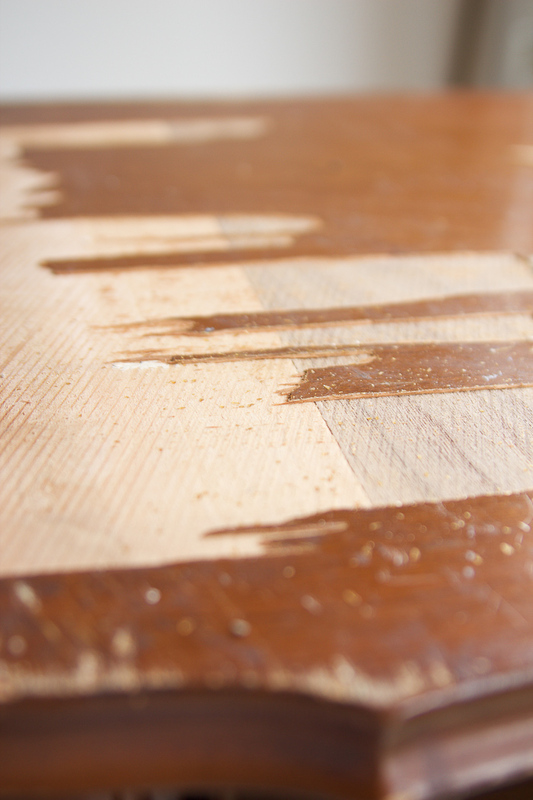 Wood putty works like magic and will still stand up to wear and tear. So don’t be afraid to use it! 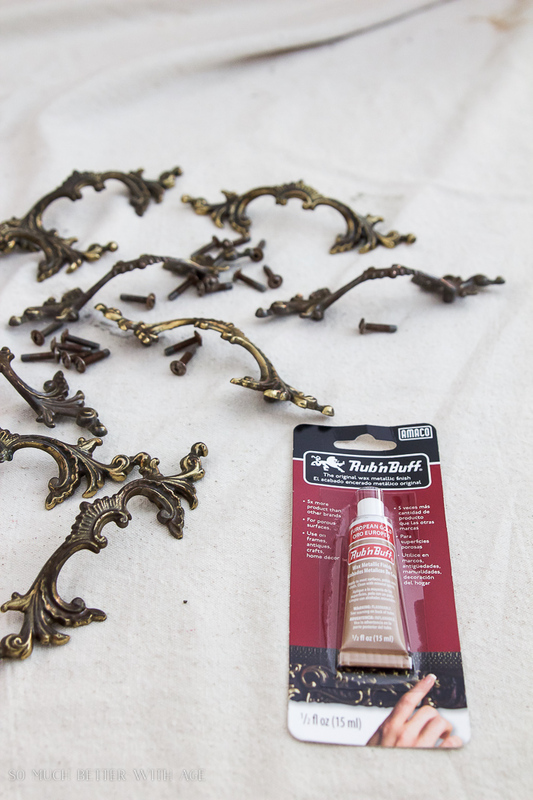 It’s your best friend in furniture repair. 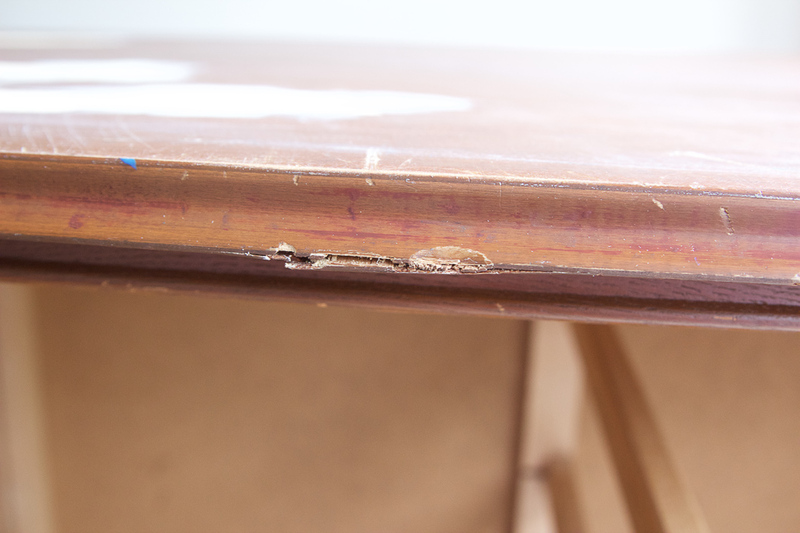 You’ll come across all sorts of little cracks and holes and it will be difficult to get your putty knife into. Just dab your finger into the mud and push it into the cracks. Using a sanding sponge after its dried will be easiest to get a smooth finish. 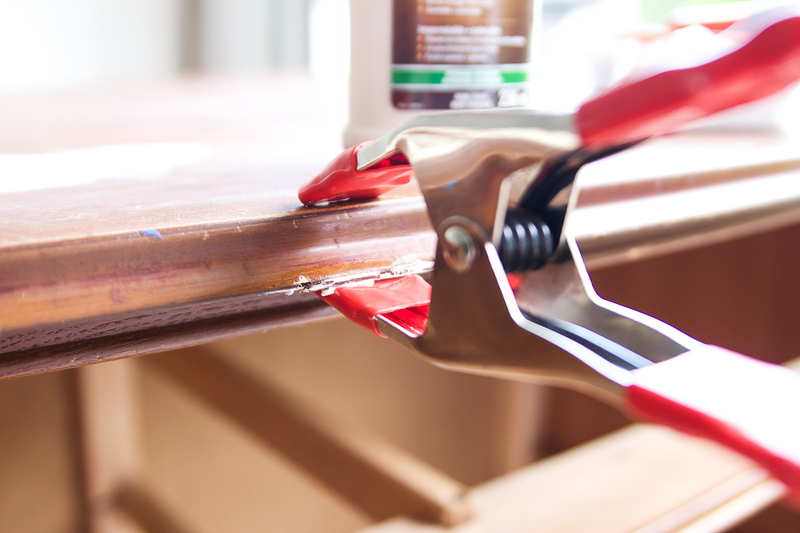 For larger cracks, use wood glue and hold together with clamps for 24 hours. There was one handle missing on this dresser (of course, just one!) 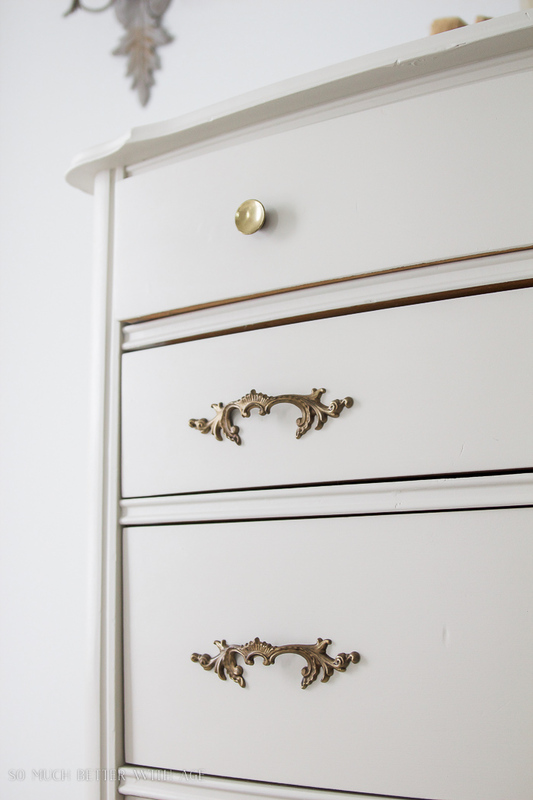 and I had some leftover knobs from the vintage pink dresser but they were just single knobs not handles. 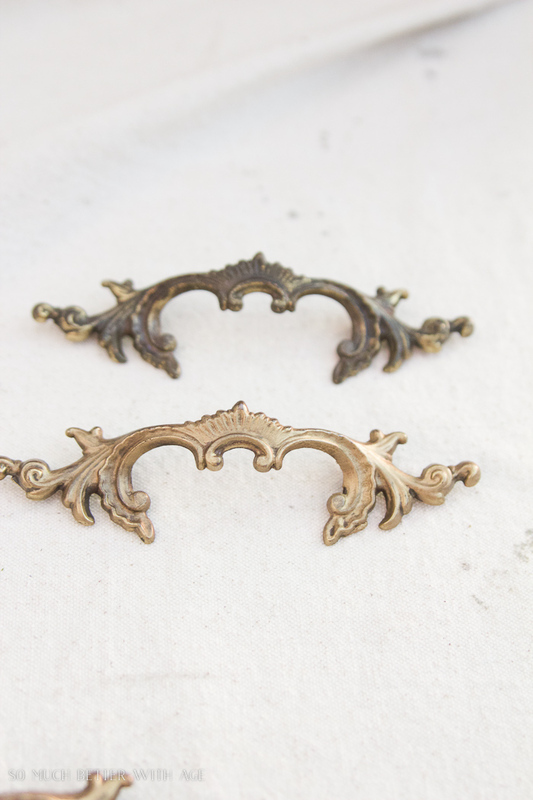 You can find vintage knobs at thrift stores or antique stores or new knobs that look old at places like Anthropologie. 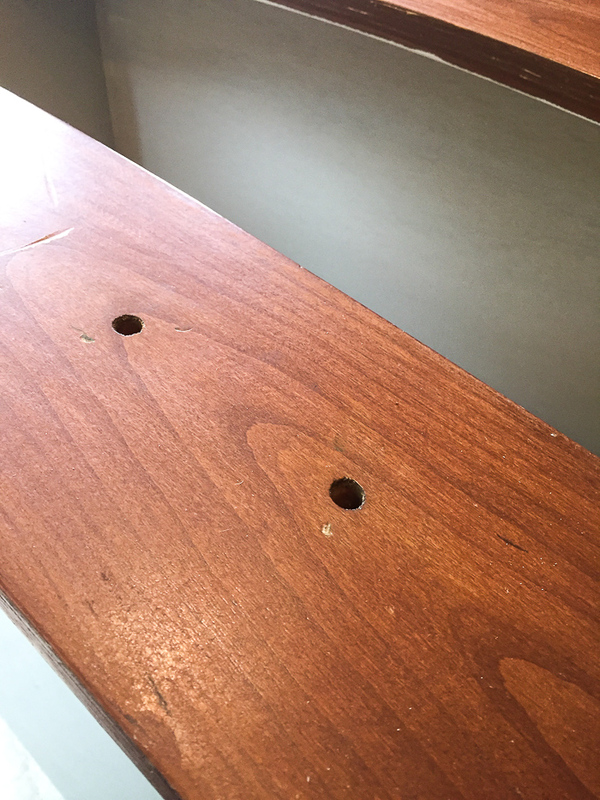 I puttied up these holes with wood filler and sanded (I repeated that process about 2-3 times like above) until I had a smooth finish and drilled a new hole in the centre for the single knob. There was one random handle missing but I made sure to add two knobs to the top drawer for a cohesive look. 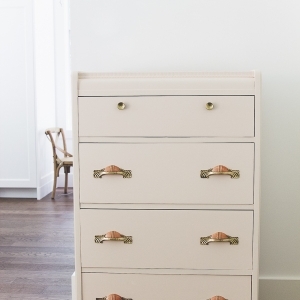 One random knob in the middle of the dresser would not look good. 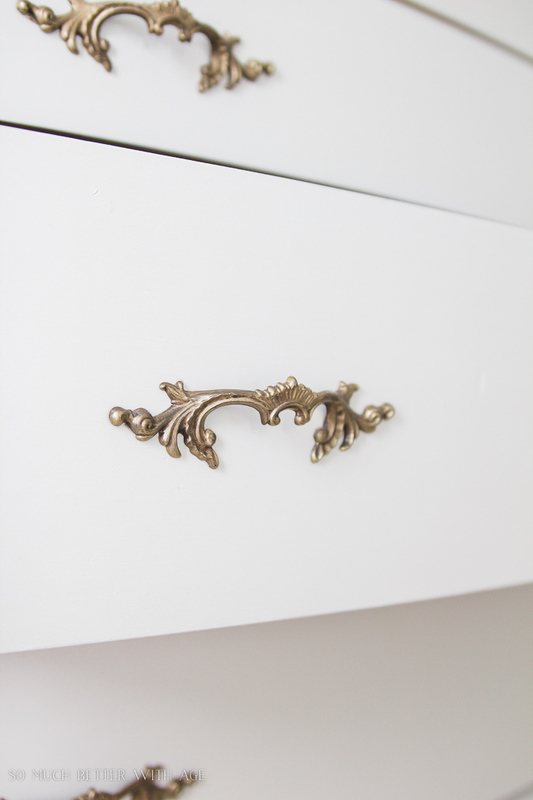 Make sure you do the same for both handles on a drawer. 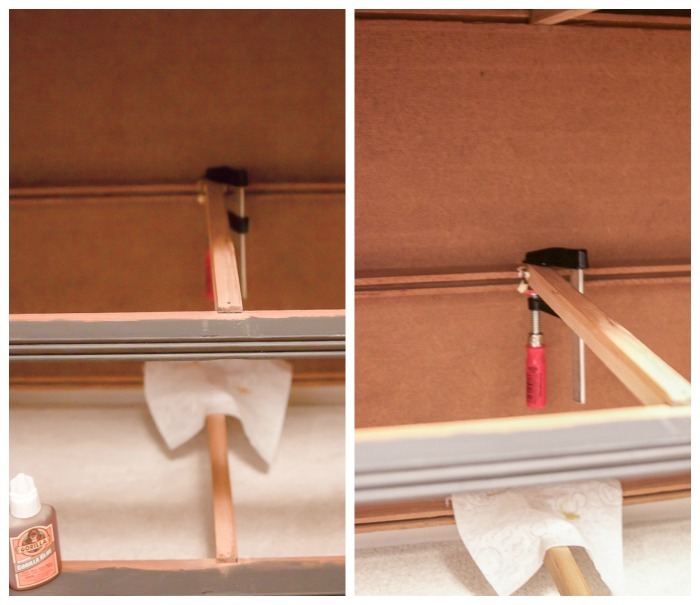 Drawer guides are a two-part mechanism. One part stays on the bottom of the drawer and the other part is attached inside the dresser guiding in the drawer. 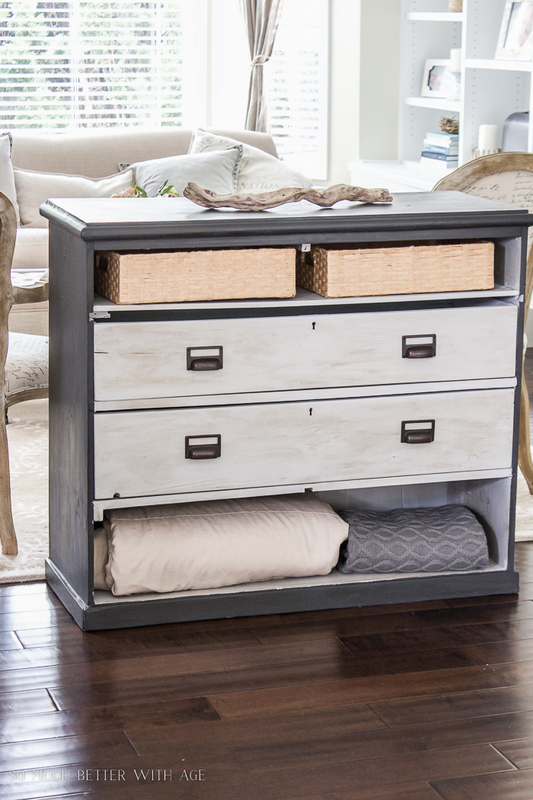 When the inner drawer guide is loose, the drawer won’t guide in straight and sit flush. So annoying. Using Gorilla Glue, dab the parts that are loose and clamp into place and let dry for 24 hours. 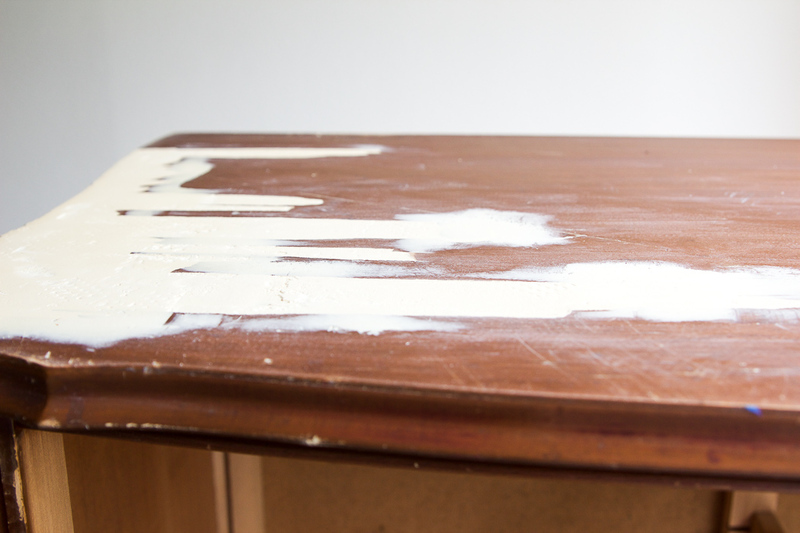 Put a rag or paper towel underneath as the glue will ooze before it completely dries. These are really bad photos but I wanted you to get an idea of how I did it. 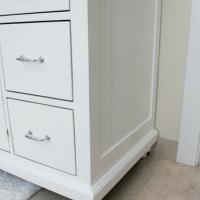 It’s an essential step for flush drawer fronts. For this dresser, there were two missing drawer guides. I took some existing drawer guides from the same dresser that were nearly falling off anyway and cut them in half with a jigsaw. I attached the cut guides with an adhesive silicone and glued it to the back part of each drawer. I sat bricks on them overnight to secure into place. I thought half would be fine as they just need to guide the drawer in on the rail and the drawer will still align up flush. 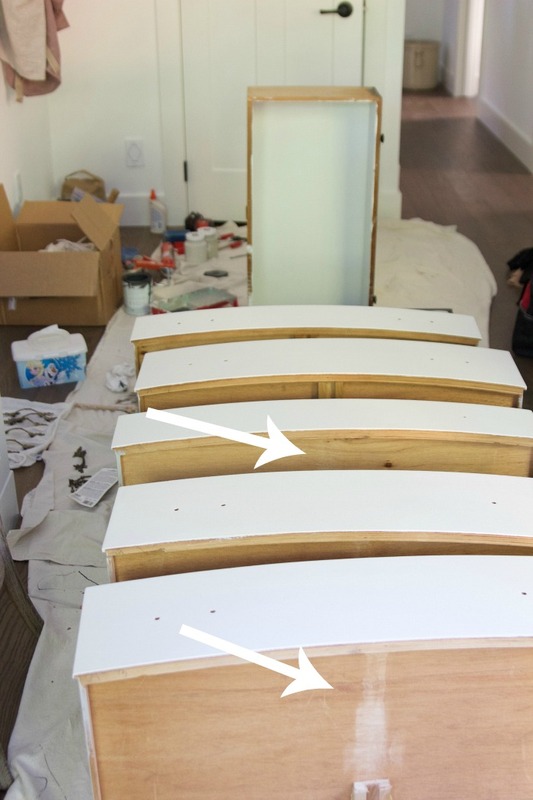 Before I went this route, I ordered from different woodworking supply shops and none of the drawer guides were the right size for this old dresser. 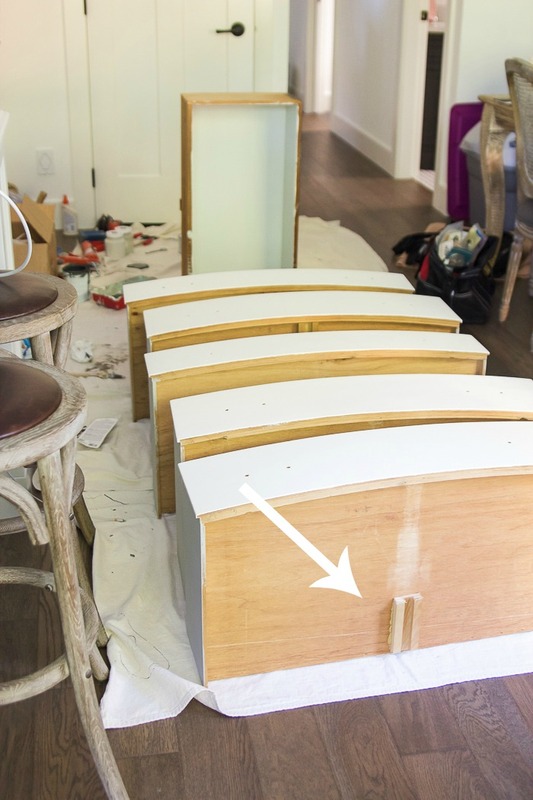 New drawers (like kitchen drawers) have a small plastic attachment at the back which will not work so this is the best DIY route I could think of. You paint it of course! 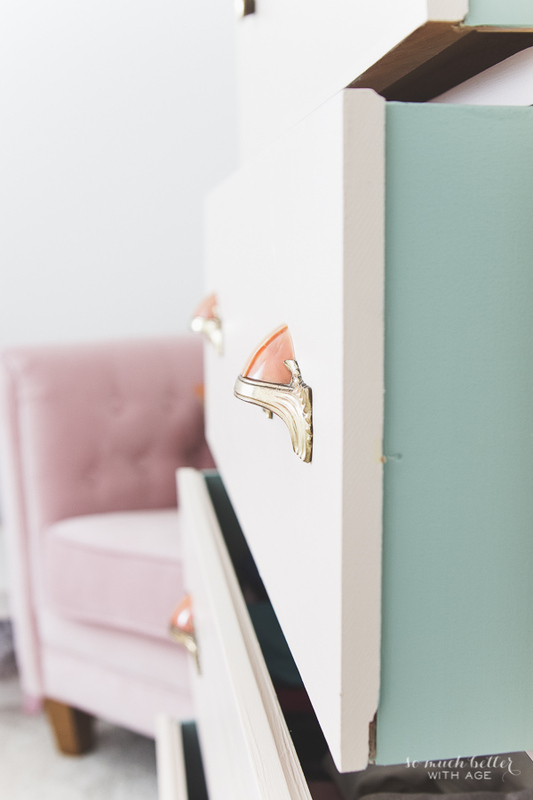 I chose two paint colors again like I did with the vintage pink dresser. 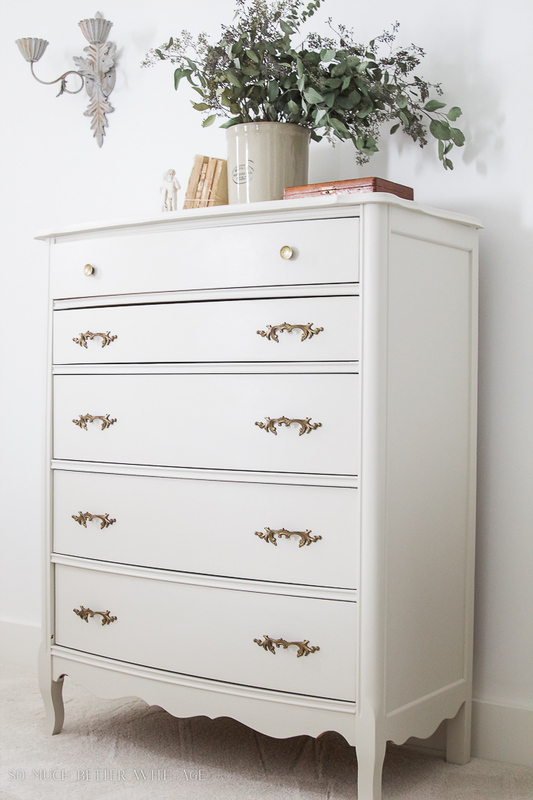 I picked Champlain for the main color and Linen for the interior and exterior of the drawers. 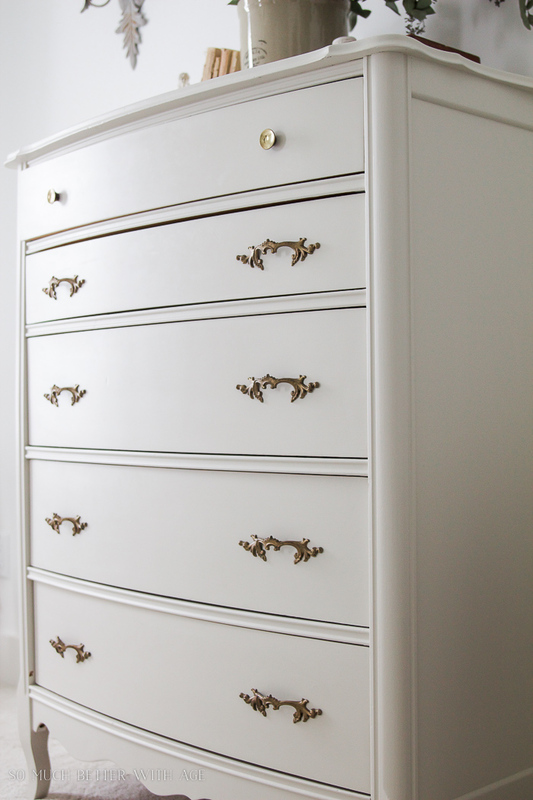 I applied a primer (this one is my favorite) then two coats of each color to the dresser. I finished it off with the clear wax and buffed it off to a smooth finish. 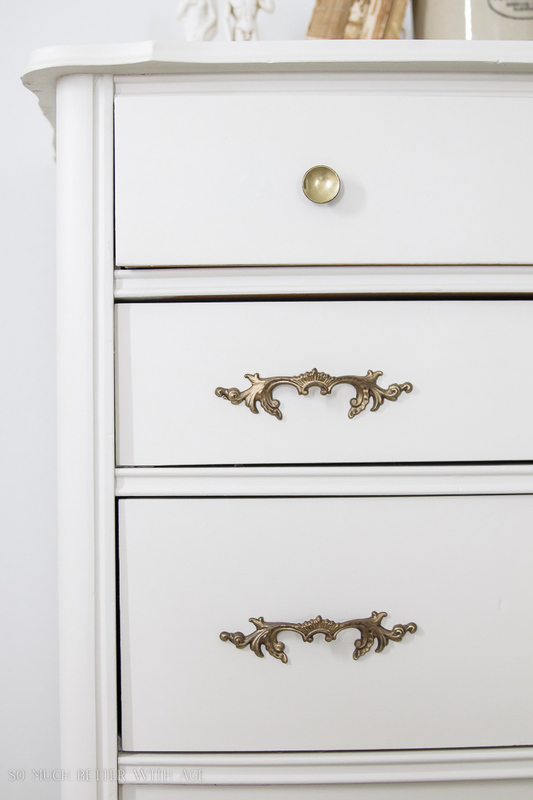 The hardware belonging to an old dresser can be so worn that the original finish has worn off or it can be too brassy looking. I used Rub N Buff in European Gold finish to give it that matte gold finish. You just dab some on a cloth and rub it in. That’s it. This stuff is pretty amazing. 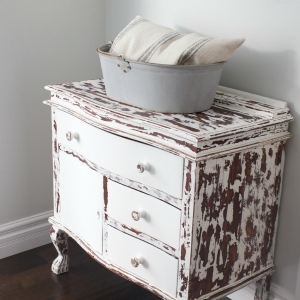 You can also rub it off if it’s too much or if you want a distressed look. It goes on like a wax or furniture polish. 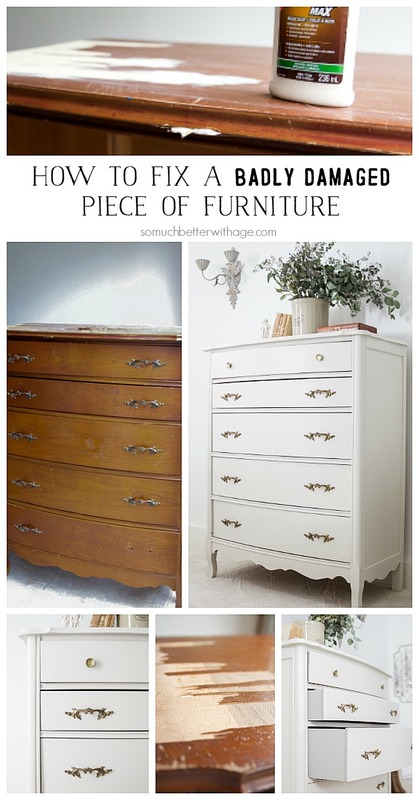 Do you remember that piece of furniture I posted about a couple of years ago, the one that had completely fallen apart and was on its way to the dump when I decided to resuscitate it? 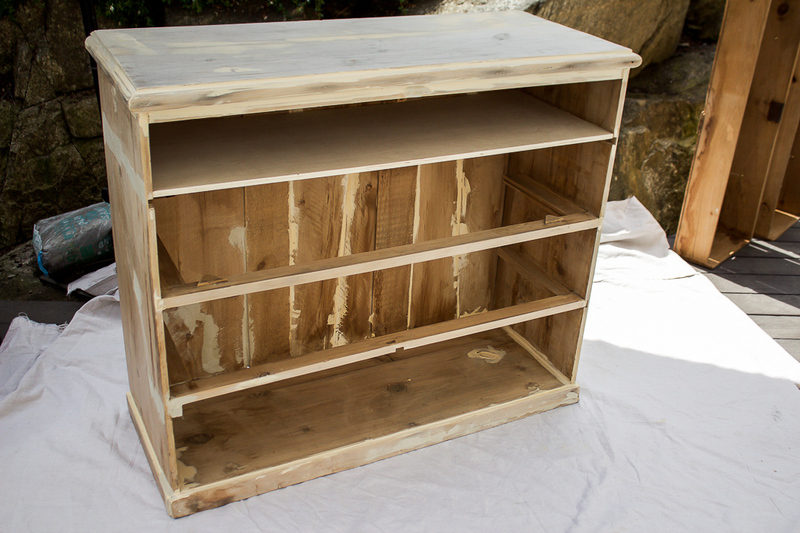 I decided that large amounts of wood putty and nails would do the trick and it did! The small top drawers were completely broken so I opted for an open shelf there instead. You can see all the putty everywhere and I added a new piece of wood to the inner top shelf that was once two little drawers. There were only three feet so I took the existing feet off and it just sat flush on the ground. 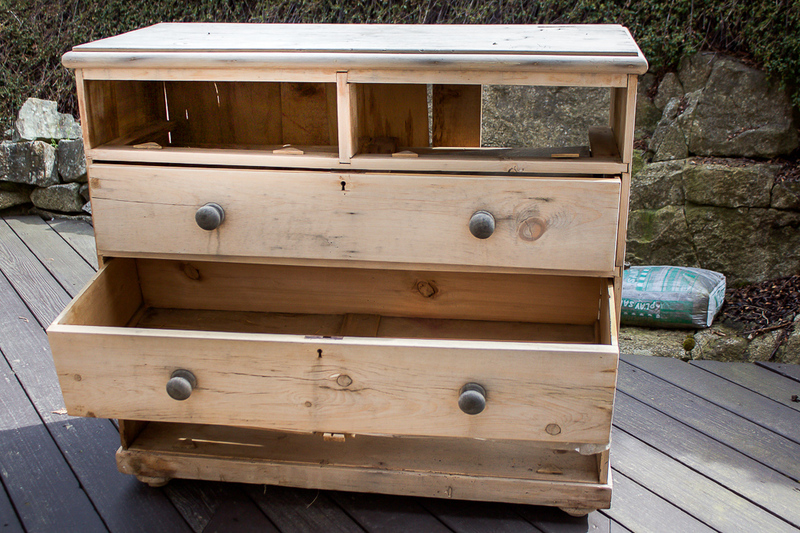 Tons of puttying, sanding, nailing, painting and it’s now rescued! 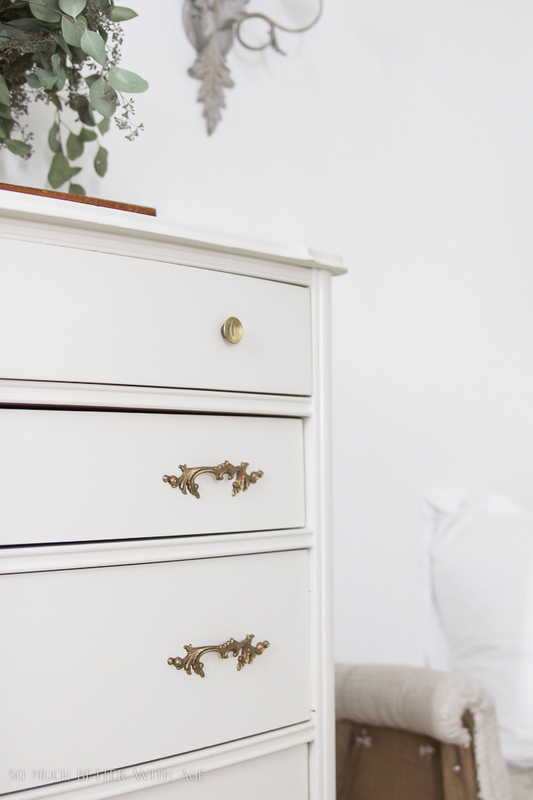 So here is the finished dresser that I started this post with. It makes all the hard work worthwhile. 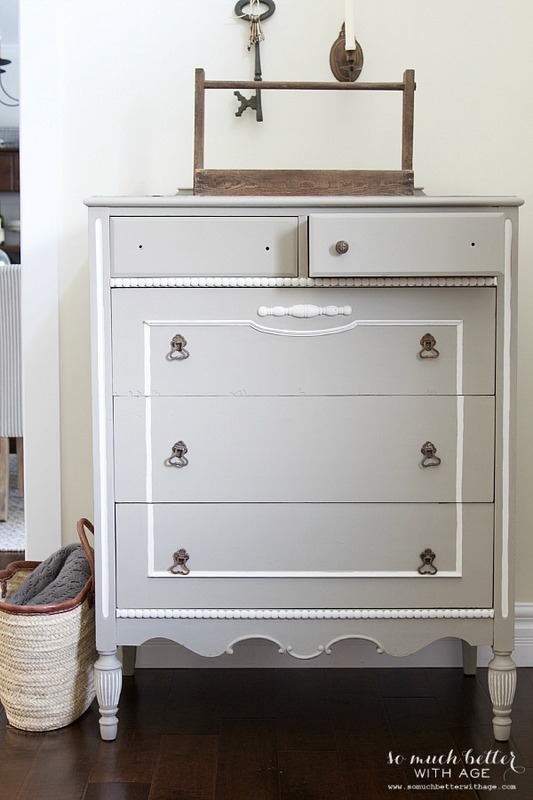 I’m in love with this dresser now and you’d never know it had so many problems. How about you? 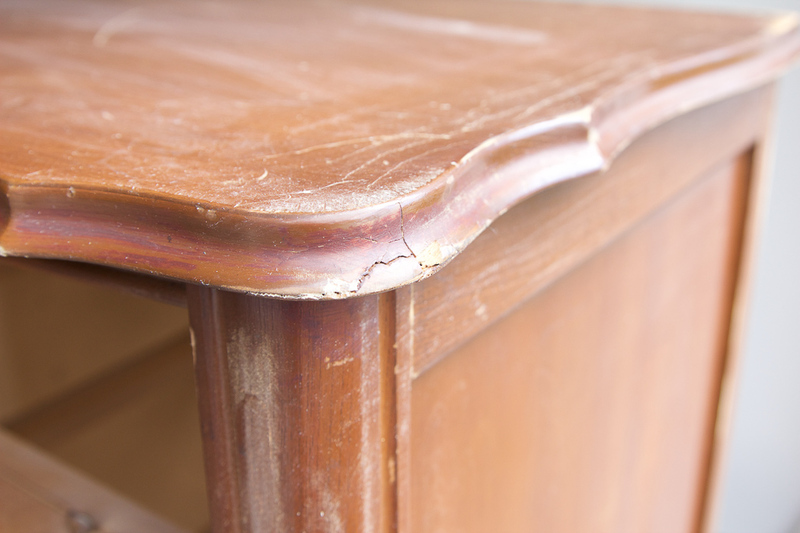 Do you think you can fix a piece of furniture? I know you can! Love Love Love!!! Wood putty, here I come!!! haha it’s so true! Thanks Elizabeth! I’m an impatient sort and hate to wait for the wood putty to dry. Instead, I use auto body filler! It is a two-part system and once you mix it together, it hardens chemically, rather than drying (much like epoxy). It is easy to work with, easy to sand, and stands up to abuse. The only down-side is the smell, so I generally only use it in the garage. Oooohhh, great tip, Shawnda! I have seen it before but haven’t tried it. Thanks for sharing. Bravo so elegant! Wood putty is amazing! So glad this post helped you, Angie! Your handles are upside down ? I thought they were but I also thought they looked funny the other way lol. I’ve been meaning to change them. Thank you! 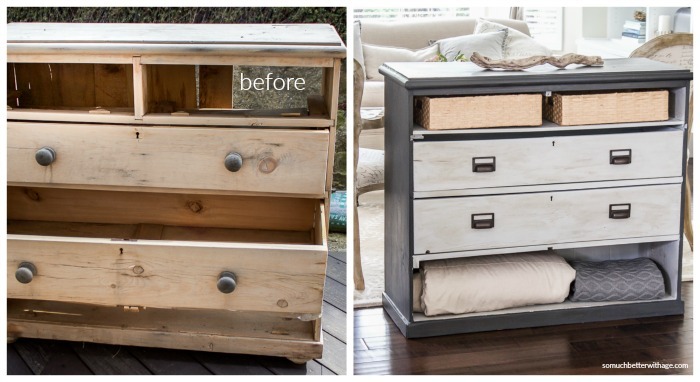 confused on what color you used on the badly damaged dresser. it looks great!!! The colour is called Champlain from Fusion Mineral Paint. 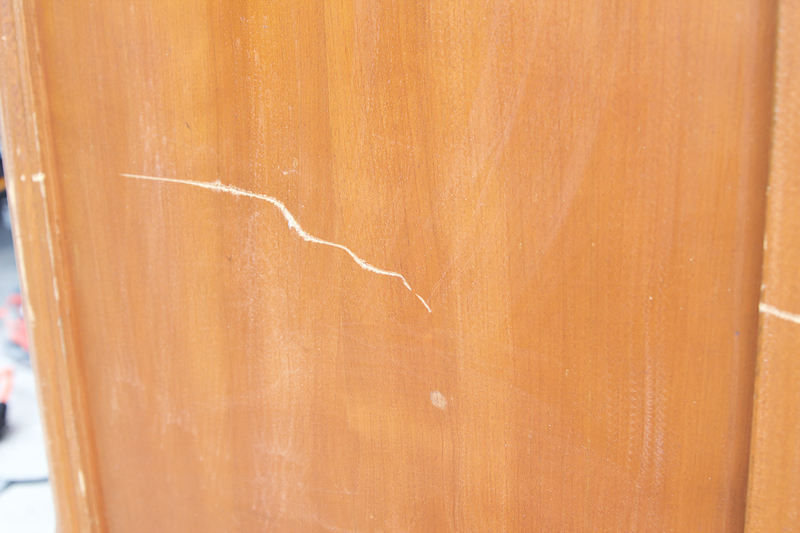 I really liked how you gave the different ways to repair badly damaged furniture pieces, but what I liked the most was the cracks and holes and how I can just use my fingers to fill them with mud. I would love to give them a try, but my job impedes me from doing anything else in the house. Because of this, I think it is better if I just hire a professional to fix the patio furniture. Though I will keep this for future use. Thanks! Great Job, you have inspired a lot with your work. 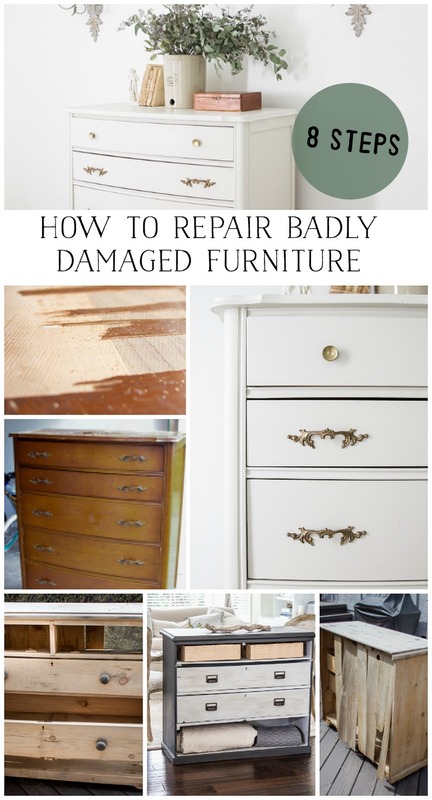 It is need of everyone how to get rid of bad furniture. and how to prepare that according to our need. 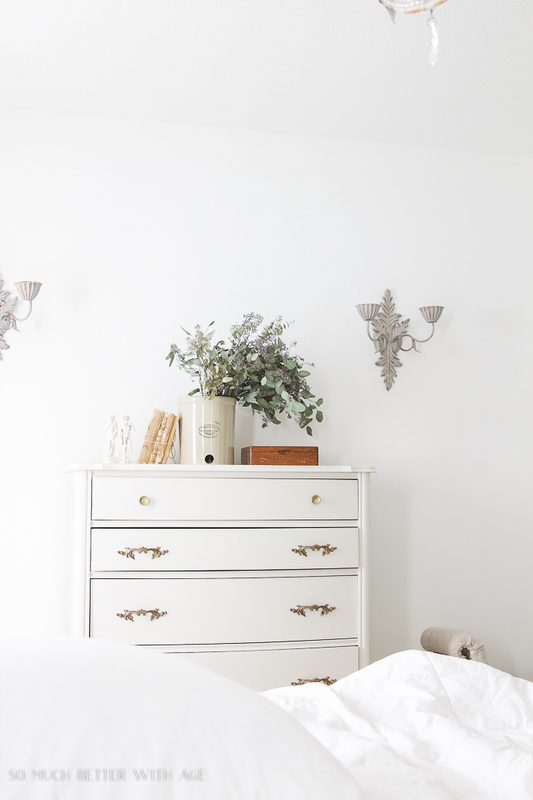 The white dresser is stunning. What was the brand of the clear wax you applied? Is it yellowing at all? 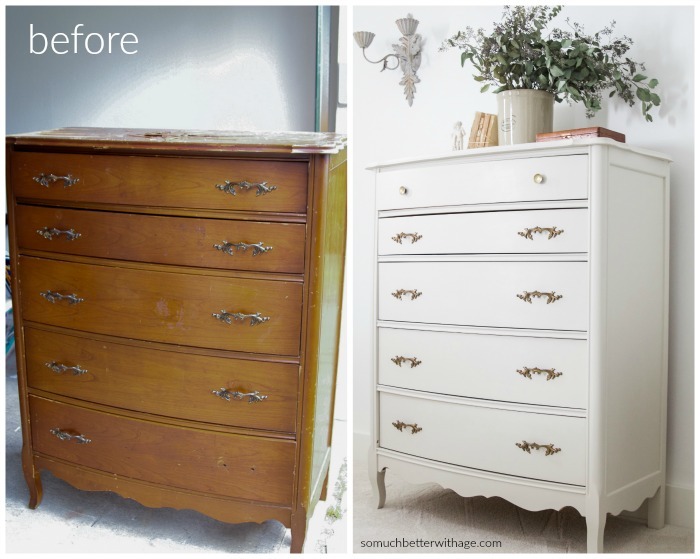 You said you used two different paint colors, I don’t see that from the front of the dresser, but no matter, I love it! Your sanded finish is excellent. 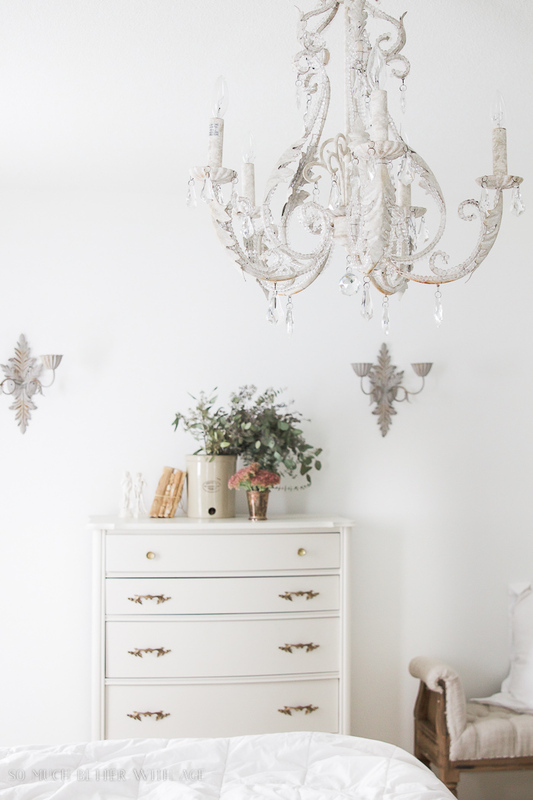 Hi Claudia, I use Annie Sloan Clear Wax or Fusional Mineral Paint Clear Furniture Wax. Both of those do not yellow. The second color is on the inside of the drawers.